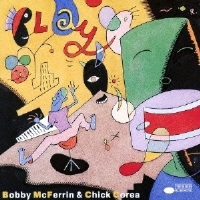 Play by vocalist Bobby McFerrin and pianist Chick Corea, recorded live in concert in 1990, exemplifies jazz with its spontaneity, virtuosic improvisations and musical conversations at the highest level, and sense of humor. Above all, the two performers are having FUN and oh so very entertaining. There are many highlights, from Chick Corea's classic composition "Spain" to freely improvised "Even From Me" to an unforgettable rendition of "Autumn Leaves" filled in turn with wacky comedy and incredible musical moments. A must-own disc not only for jazz fans but all music lovers! Recorded live in concert at Wolftrap, Vienna, Virginia on June 23, 1990 and at Carnegie Hall, NYC on June 27, 1990. SHM-CD uses an advanced polycarbonate material for superior sound quality and is compatible with all CD players.